The House offers a catered buffet luncheon for parties of 25 or over. Groups of under 25, or other groups may bring a packed lunch and the House will provide drinks. After Lunch there is an opportunity for free time in Oxford. It is sometimes possible to arrange a guided walking tour of the city and University with an accredited guide. Fees are available on request. 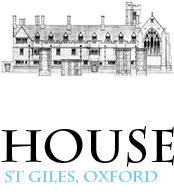 Pusey House is located on the west side of St Giles, alongside Pusey Street. There is time-restricted pay-and-display parking outside the house, and there are a number of car parks in Oxford city centre, just a couple of minutes’ walk away. If you are coming to Oxford by train, the house is a ten minute walk from the station. All local buses stop in the city centre, and all national bus services stop at Gloucester Green, a five minute walk from the house.